There are some coasters on the top, along with some medicines and a table lamp. And you can see some magazines stacked in the bottom section... copies of Life Positive mainly. 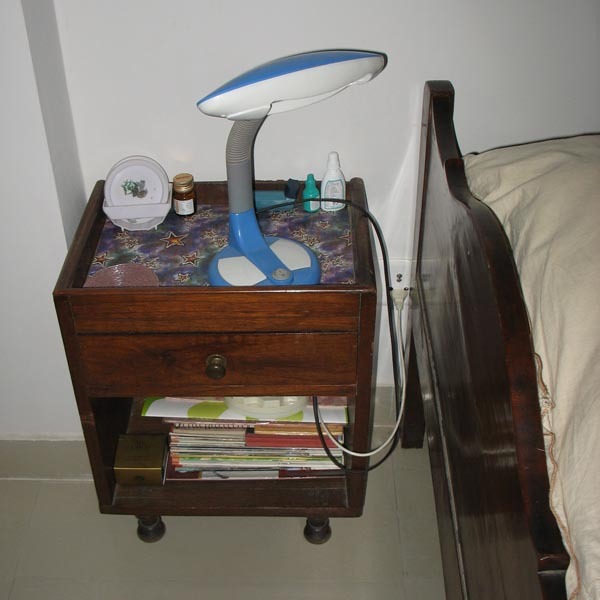 And an electric connecting board, to hold the plugs for the lamp, the mosquito repellent unit, and a mobile charger. That's all. Nothing much to write about this particular topic. This is my fourth post for NaBloPoMo March 2012. Link to the previous post: "Photo A Day: Neighborhood"
Why do you not have any dust anywhere? Oh but there is! Probably not showing up in the pic. Ah good. I was getting a complex. kyun? Kya ye saari dust wahan se aa rahi hai Jaipur? Nehi. The only thing keeping the Thar from overrunning Delhi are the Aravalis. Jaipur ke dust se bachta hai Dilli. Mine neither, in school. In fact I simply ignored huge swathes of my geography textbook in Xth, boards be hanged. I could not even read, forget memorize, those mind numbing chapters about the mineral reserves found in our various states. LOL @ mineral reserves! It was quite impossible to remember what mineral/crop was produced by which state of the country. After a brief cursory glance through the entire book, I realized that most of the stuff was found in Bihar. So I just memorized about the rest of the stuff, and in the exam, I put everything I didn't remember in Bihar. Of course, it was the before-partition Bihar that time. After partition, all the good stuff went to Jharkhand! Apparently, you're the only reader on this blog to whom that section is visible!